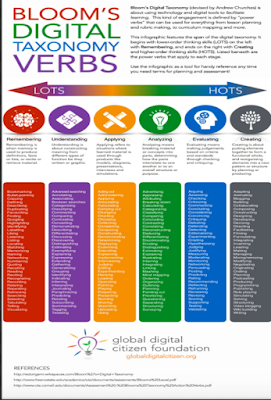 Bloom’s Digital Taxonomy Verbs is a wonderful infographic created and shared by the folks in Global Digital Citizen. The infographic features a number of verbs aligned with each of the categories of Bloom’s taxonomy progressing from lower-order thinking skills (LOTS) to higher-order thinking skills (HOTS). This work is also available for free download and print in both PDF and poster format. You can access and download it from this page. You can also check this practical Cheat Sheet featuring some of the best apps and web tools to use for each of the six thinking levels of Bloom’s digital taxonomy.